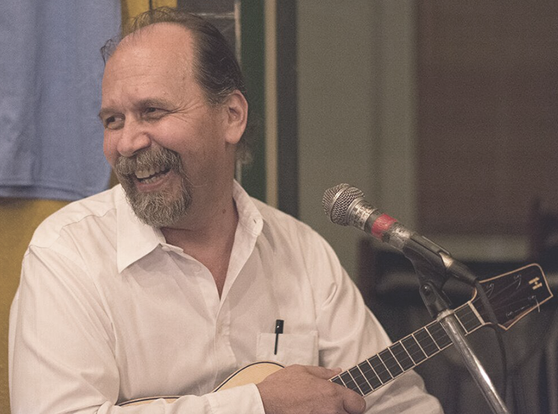 Thom started playing guitar in 1962 and an old 1920 banjo ukulele in 1964. He also plays many string instruments including ukulele, guitar, bass, banjo, dulcimer, mouthbow and autoharp. Thom plays lead in the group. His simple line allows melodic ideas to be captured by listeners more than that of a myriad of notes. Outside of playing with the Flea Bitten Dawgs, one of Thom's favorite musical memories was being asked to play with Melvin Seals of the Jerry Garcia Band and joined them for part of their set when the Dawgs opened for them at a music festival in Arkansas. Thom is also the founder and music director for the Whole Earth Nuclear Ukulele Orchestra, a twenty-five piece ukulele orchestra, which played their sixth yearly benefit show in 2015. "Jumping fleas is a dawgs best friend."